The Imperial War Museum North is brings the established multi-site national museum (see Foster's American Air Museum building) to the north of England. Libeskind's design is a dramatic and symbolic sculpture, with three linked buildings shaped as shards from a broken globe, 'to reflect the way war has devastated our world'. For three broken shards, it is impressively serene and beautiful, as well as challenging and disturbing. The three shards are designated as air, earth and water, representing three battlegrounds of war. Here the imagery becomes less obvious, and unconvincingly linked with how the building works as a museum. The air shard is simply an empty tower, 55 meters high, with a viewing platform two thirds of the way up. Rather it is not empty, but filled with the uninspired scaffolding required to support it in the wind. The elegance of the sculptural shape is not matched by any elegance in the engineering that supports it. 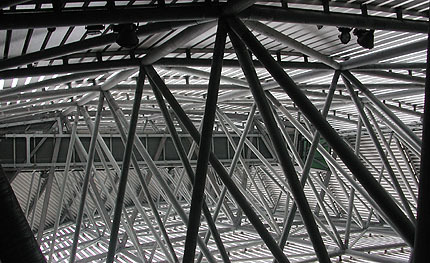 The interior of the main (earth) shard is a sparsely filled exhibition space artificially lit and punctuated by Libeskind's distinctive acute angles and slashes in the ceiling. 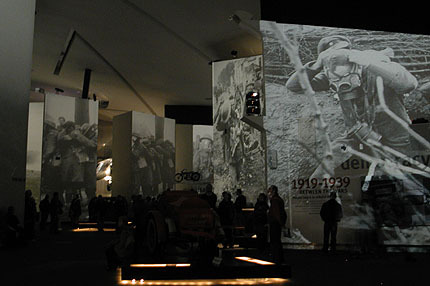 For twenty minutes in each hour this space is darkened and transformed into an 'experience' of the sounds and images of war, with every one of the angled walls becoming floor-to-ceiling projection screens. As a museum format the sequence of black-and-white images are curiously un-moving, despite the best efforts of the building which displays them impressively. 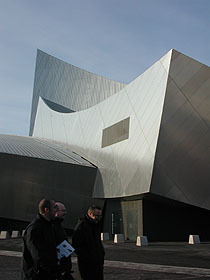 The imagery of this building clearly draws heavily on Libeskind's earlier Jewish museum in Berlin - the symbolic sculptural shapes, sharp angles, metal cladding and slash-lines in the surfaces. The justification is that the underlying theme of both buildings is ultimately similar, providing an unusually convincing rationale for such deconstructivist architecture. 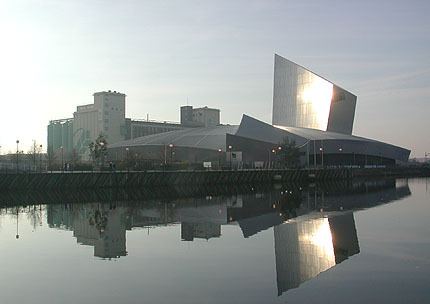 The Imperial War Museum North is in Salford Quays on the Manchester Ship Canal, on the west edge of Manchester. 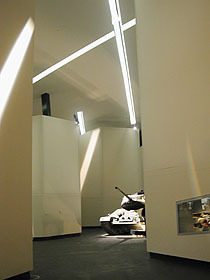 Comprehensive visitor information is available from the museum's web site at http://north.iwm.org.uk/. 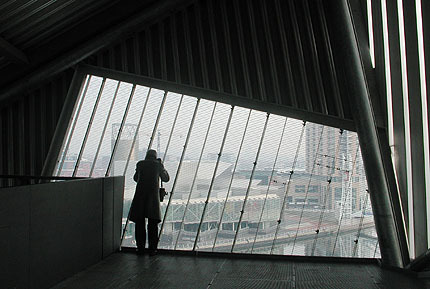 In addition to the museum site above, Daniel Libeskind provides his own account of the building and its design at his own web site. Jonathan Glancey provides a critically enthusiastic account of the building at Guardian Unlimited.